A recent UN report from the Human Rights Council (2017) focused on mental health provision around the world, and stated that public policies continue to neglect the importance of the conditions that lead to poor mental health. These include violence, disempowerment, social exclusion and isolation, breakdown of communities, and poverty. Health care in general can make a big difference to how countries grow their economies. A commission by “The Lancet” medical journal concluded that countries received £10 benefit for every £1 invested in health care and prevention of disease. But many countries have only a small proportion of the population paying tax, so governments have little money to spend on health. Poverty is often made worse by corruption. In Uganda, fertiliser can make a big difference to the amount of a crop harvested. But it can be impossible to know if the fertiliser on sale is genuine or not. Do you spend your small amount of money on what may be fake, and risk wasting your money, or risk a smaller harvest and have less to sell, to pay school fees etc? Hard decisions all the time when you have so little. In the news, we sometimes see extreme poverty, hunger and need, perhaps caused by conflict or natural disaster. Everyday poverty is often overlooked, and yet it is a gruelling part of life for so many people. In Uganda, about a third of the population still exists on less than £1 a day, and lacks access to sanitation and clean water. This is true in towns and cities as well as the rural areas. 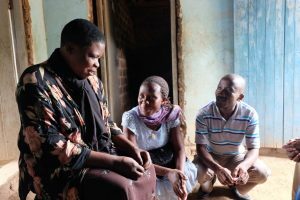 One of the challenges the medical services we support face is that people with mental illness and epilepsy often have to pay for their medication. The government supplies are not adequate for whatever reason, and the non-government units have to charge. We are exploring a “community drug bank” which has worked elsewhere in Uganda. In this a community group all contribute and buy their drugs at cost. It is still hard, when you have so little money. 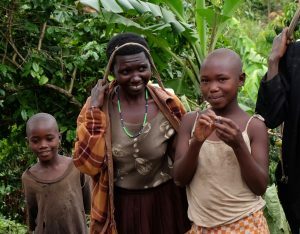 Many visitors to rural Africa are challenged by the fact that many local people living in poverty enjoy life, in a way that we in rich countries could learn from. They are also willing to share the little they have in ways that we, with so much more, are not always willing to do. nurses working in rural areas in Uganda, with limited resources and doing the best they can. turn to when their patients are mentally distressed. difference in keeping someone alive. 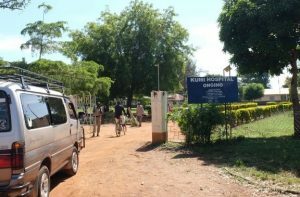 Kumi Hospital lies several km from the main road north from Mbale to South Sudan, in eastern Uganda. On a dirt road with a very few scattered houses, we found the hospital compound. It’s spacious, pleasant and peaceful. The few patients we saw strolled among the trees, wards and hospital departments. At the main offices a secretary greeted us and led us to the Human Resources office. The in-charge there looked a bit panicky. (“When did you say you sent the email?”) Eventually they found clinical officer Francis Ejoku, who knew exactly when we’d sent the email and had been our chief correspondent. He was quickly joined by registered nurse Amuron Scholastica. With these two enthusiastic individuals we had a very happy two-hour discussion. 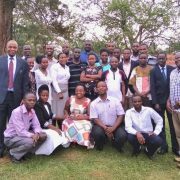 In August JF sponsored mhGAP training in Kampala. The three hospitals JF already supports – Kisiizi, Bwindi and Kagando – sent 12 delegates. They were joined by eager volunteers from other church hospitals. Kumi was one of these. Francis and Amuron found the course very helpful, and have already started rolling out their training to their colleagues. Neither is psychiatrically trained but both have a genuine interest in mental health. Kumi began as a centre for the treatment of patients with leprosy. Such patients were regarded as highly contagious and kept away from the general public, hence the remote location. Today leprosy patients are treated in the medical wards along with everyone else, with no risk. However, the ward is laid out in small self-contained units, ideal for treating MH patients who may be disturbed or needing a particularly quiet environment. 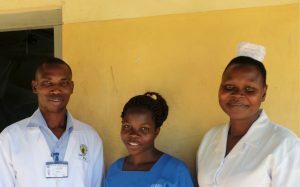 With no specialist psychiatric staff, Kumi relies on a visiting clinical officer who comes once a week and sees mostly epileptic patients. 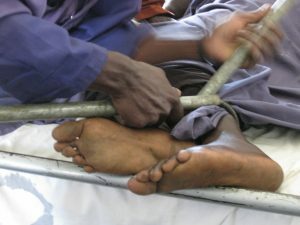 Seriously mentally ill patients have to go to Mbale for admission. On our tour of the hospital we met a gentleman who had been admitted with self-poisoning following a big fight between his two wives. One of them was hurt. The court case ended in a large fine for the one inflicting the damage. But as she had no money, the husband was expected to pay. The result was his significant overdose. Polygamy is complicated. Suicide and self-harm are common in this area. We would be interested to know why. 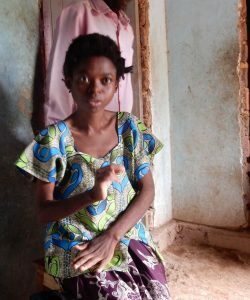 People in rural areas like Kumi can’t afford to spend money on relatives with mental illness and epilepsy as these are long term conditions. They can’t afford the transport to bring patients for assessment or review either. Many view the mentally ill as “useless” – families and communities don’t think that anything can be done to help. They imagine that the person will never be well enough to work in the fields where their food is grown. Amuron and Francis would love to see a change in people’s attitudes. They want to reduce the stigma which causes so much suffering. They would love it if more mentally ill people could be properly cared for. And they would be really pleased if their colleagues and the local community knew a lot more about mental health and how it can be treated. When we asked Francis about his motivation he said “It’s about having a mind to help”….. “You have to see these people in your heart”. 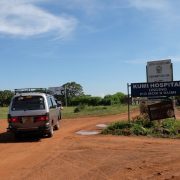 Since our visit, Jamie’s Fund has sponsored Amuron and Francis to carry out mhGAP training with the clinical staff at Kumi hospital and also at Ngora Freda Carr hospital which is about 15 miles away. Across the world, mental health is rarely at the top of the agenda when it comes to discussing healthcare. 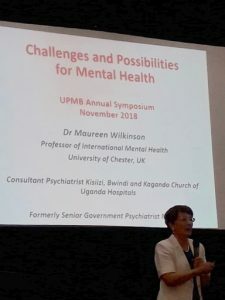 It was a wonderful milestone, therefore, when the coordinating body of the Church of Uganda hospitals, UPMB*, decided to feature mental health as a significant part of its annual symposium for 2018. So it was that on the 29thNovember, four representatives of Jamie’s Fund arrived at the Silver Springs Hotel in Kampala, along with over 400 representatives of more than 200 health centres and hospitals from across Uganda that make up the UPMB “family”. It was an interesting and varied programme with most of the presentations also being available on-line**. The morning was taken up with a variety of business and after, a good lunch, the symposium settled down to hear about mental health. The first of the mental health presentations was delivered by Jamie’s Fund in the person of Dr Maureen Wilkinson. Maureen’s approach was highly effective and differed from other presentations: Rather than drily quoting the numbers, or listing the challenges of delivering mental health in Uganda, Maureen simply told the stories of a number of patients who had been released from their chains and once again enabled to walk in the light. better life and this in itself was a challenge to the audience: How can we find and treat people much sooner so that they don’t become chronically ill and die prematurely? These and other challenges were posed by Maureen and left the audience in no doubt that the challenges are there but that they can be tackled. This was illustrated also in the next talk. 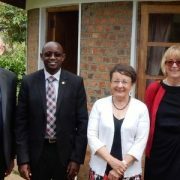 Dr Francis, from Kisiizi, spoke of the experience of working with Jamie’s Fund and of the impact both of the Ahamuza Centre (built by Jamie’s Fund and opened in May, 2017) and of the Community Mental Health programme being run by the hospital. Following Dr Francis, Dr Joyce Nalugya, a Ugandan psychiatrist, spoke very powerfully about the need to put much greater resources into mental health if we don’t want a major crisis. In many ways, Dr Joyce gave the evidence that supported the talk given by Dr Maureen. It was hugely encouraging for those of us from Jamie’s Fund, not only to have a slot in the programme of this prestigious event but to find that mental health is increasingly being seen as important. Certainly the delegates left the symposium knowing that good mental health care delivered early and consistently has the power to transform the lives not only of patients but of their families and communities. 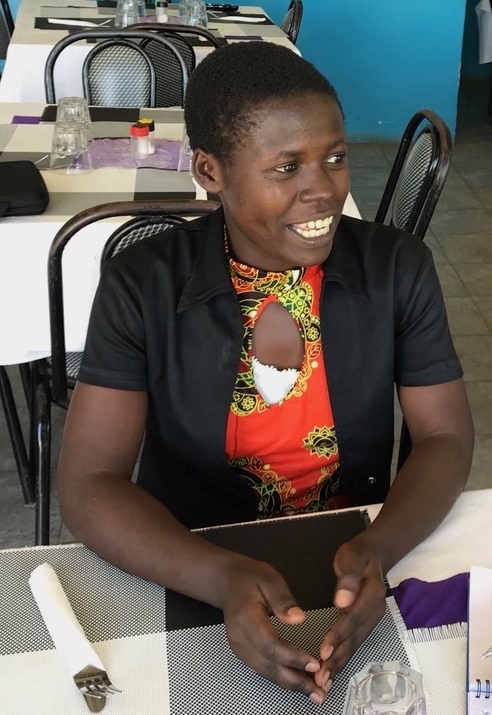 Over the past few months Jamie’s Fund has been deepening the connection with one of the main groups of faith-based hospitals in Uganda. 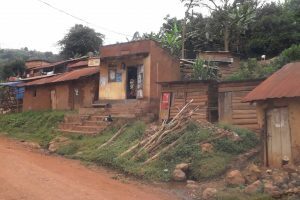 The Uganda Protestant Medical Bureau (UPMB) coordinates over 200 health facilities across the country from the tiny Health Centre 1, to Health Centre IV and on right up to hospitals, like Kisiizi, Bwindi and Kagando. 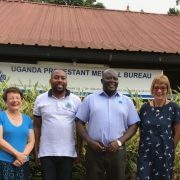 On a recent visit to Uganda (November, 2018) representatives of Jamie’s Fund visited the UPMB offices in Kampala and while there were invited to take part in the making of a video on Mental Health. This link will take you to this short 8-minute YouTube video, which we invite you to view. UPMB have made a number of videos on different aspects of healthcare, but this is the first into the area of Mental Health. Other UPMB videos can also be found on YouTube. In addition to working with UPMB, Jamie’s Fund is also seeking to build links with other non-government hospitals and health facilities. Some of these are faith-based institutions. Jamie’s Fund has also begun to develop connections with government hospitals and health centres both directly and also through the Ministry of Health itself. Most of these approaches are at an early stage, but we will publish more information as it becomes available. What is happening in mental health services in other hospitals in Uganda? We are delighted to share the results of a survey of what mental health care is being provided at Church of Uganda hospitals. Click here. 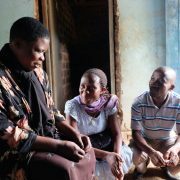 Jamie’s Fund worked with the Ugandan Protestant Medical Bureau (UPMB) to organise the survey and to write up the results. There are 28 units and 23 of them responded. A total of 11 units already employ staff with psychiatric training. 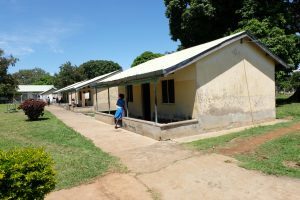 We are working with four of them so far but it is very encouraging to find there are seven other hospitals that employ psychiatric staff, some of whom are already doing quite a lot to reach those in need. Others have only one trained member of staff coping with disturbed people coming to the hospital, and these staff can feel a bit isolated. Many of the other units are interested in starting services. In mid-November four members of Jamie’s Fund are going to Uganda and will split into two teams to visit 12 of the units, focussing mainly on the hospitals that are already providing services. We need to see how we can use our relatively slender resources to support staff and develop services. Jamie’s Fund trying to fund too much is not sustainable. We have also been invited to speak on community mental health at the annual symposium of the UPMB on the 29thof November. This is a privilege, and it is encouraging that UPMB is being so supportive of developing mental health services. http://jamiesfund.org.uk/wp-content/uploads/2018/11/DSCN4185-2.jpg 300 654 Ewan Wilkinson http://jf2016.dupecreative.com/wp-content/uploads/2017/08/jf-logo-2017.png Ewan Wilkinson2018-11-03 10:22:402018-11-03 10:22:40What is happening in mental health services in other hospitals in Uganda? Samuel (not his real name) was first brought by his mother to one of our monthly village meeting points some distance from Bwindi hospital. He was shackled on both hands and legs. His mother reported that he had been sick for 4 years presenting with aggression and violence, talking to himself and adopting unusual positions. He also had beliefs about being persecuted or threatened in some way. His relatives had chained him as they were afraid that he would destroy property and harm the people around him. When we assessed him, we diagnosed schizophrenia, a serious mental illness. He was given antipsychotic medication in the form of tablets. On our next visit, a month later, he came in with his mother, but this time he was free from his shackles. 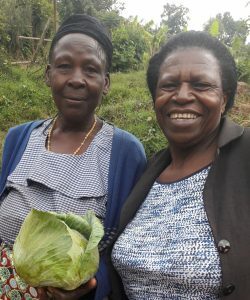 His mother said that he had started participating in some everyday activities at home including going with his parents to the land where the family grow their food. When we examined him again his state of mental health and wellbeing had improved markedly, and he was functioning well. He is continuing on treatment. 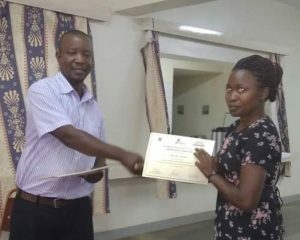 We are delighted that Jamie’s Fund has been able to sponsor a course at Butabika National Hospital in Kampala from the 20thto 24thAugust 2018 to train trainers to teach the WHO “mental health GAP” programme. This approach enables clinical staff who are not specialists in mental health to be more aware of the importance of mental illness, how to identify it and begin treatment for individual patients who come to their general clinics. 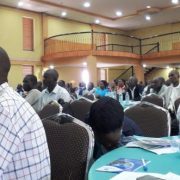 We were encouraged by the enthusiasm of psychiatric staff from across Uganda who attended. They came from nine different hospitals. 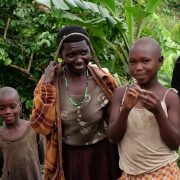 We work with Kisiizi, Bwindi and Kagando, but have only just become aware that the other six each have one or two specialist mental health staff or are hoping to develop their services. One of the outcomes of the training was that the participants have set up a mental health staff support network, as some of them are working in relative isolation. This gives us the possibility of providing further postgraduate training for them as a professional group. 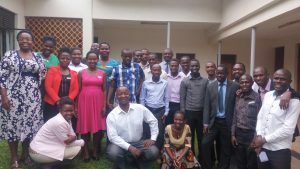 The training was expertly organised and run by Joshua Ssebunnya, a clinic psychologist working at Butabika and Makerere University who has a lot of relevant experience. Today (20th Feb 2018) was a joyous day for many reasons. Several years ago I (Maureen) met Francis, who was shackled at home because his family and the village were too frightened by his mental illness to allow him any freedom. Not long afterwards he succeeded in killing himself. Today we met his son, who had been in prison for three years with no treatment for his mental illness and was beaten most days. 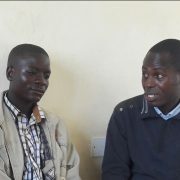 Julius has been at home now for 2 years and has been cared for by the mental health team from Kisiizi, with monthly injections for his mental illness. For the first time he is free from symptoms. He no longer hears the tormenting voices, is clean and well nourished. He still wears his shackles but the family are so thrilled by his progress that they are almost ready to remove them. Today was the first time that Sister Nancy has seen Julius smiling, and his grandmother smiled the whole time we were there. 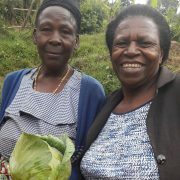 As we left, Grandma plunged into the vegetable patch, seized a cabbage, and ceremonially presented it to Nancy, still smiling. We climbed up a steep goat track in another village to meet a young man whose wrists were still shackled but not locked together. When ill, Richard is very destructive – he managed to completely destroy his mother’s house on one occasion. Now, with treatment from the team, he is well and able to work in the family fields, playing his proper part in family life for the first time. Not far away a local teacher discovered that Bruce, a mentally ill man in his early twenties, was shackled and left bound hand and foot in a banana plantation, where he was unwashed and uncared for, half naked, with no toilet facilities, and barely fed. The teacher alerted our team, treatment was begun, and we met a transformed young man, clothed and in his right mind. http://jamiesfund.org.uk/wp-content/uploads/2018/05/grandma-Nancy-the-cabbage-1.jpg 1280 1066 Ewan Wilkinson http://jf2016.dupecreative.com/wp-content/uploads/2017/08/jf-logo-2017.png Ewan Wilkinson2018-04-12 11:09:282018-05-15 11:09:57A joyous day!